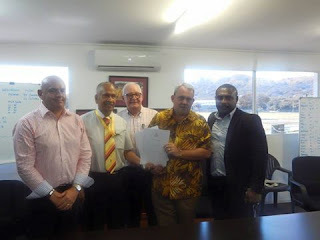 Minister for Sport nation events and APEC Justin Tkatchenko today signed a sub list agreement to officially hand over the Colts oval to Cricket PNG. The ceremony was witnessed by PNG Sport Foundation CEO Peter Tsiamalili Jr, Graham Orsborn and the Cricket PNG board. After 9 years of waiting for the government to hand over the colts oval, the code will now take full charge of owning the new look facility. Thanking the government, Chairman of Cricket PNG Mick Nades, said the signing agreement today created a historical moment for the code.